Home » Kansas City FAQs » What is the oldest book in the Missouri Valley Special Collections? What is the oldest book in the Missouri Valley Special Collections? 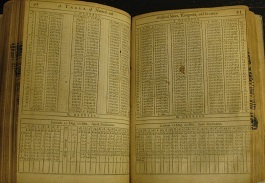 The oldest book currently held in the MVSC is Mathematical tables penned by Sir Jonas Moore in 1653. As you may suppose, the pages within cover a great breadth and depth of mathematical computations. Longtime Kansas City school superintendent J. M. Greenwood autographed this copy and presented it to the Library on January 3, 1898, giving this 350+ year old book a special Kansas City connection. Other “elderly” items in the collection include a 1672 digest of the English legal landscape under Kings Henry VIII and Edward VI, and Queens Mary and Elizabeth I; a copy of Arthur Collins’ The Peerage of England from 1709; a 1722 edition of The History of Virginia, in Four Parts by Robert Beverly; and Edmund Burke’s An Account of the European Settlements in America published in 1765. While books this old deserve gentle treatment, all five are available to researchers for use in the Missouri Valley Room.